nas01 allows your users or client compute to access files over a network. 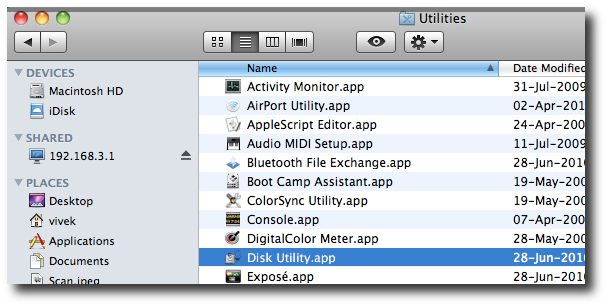 Mac OS can mount file system over a network and work as they are mounted locally. 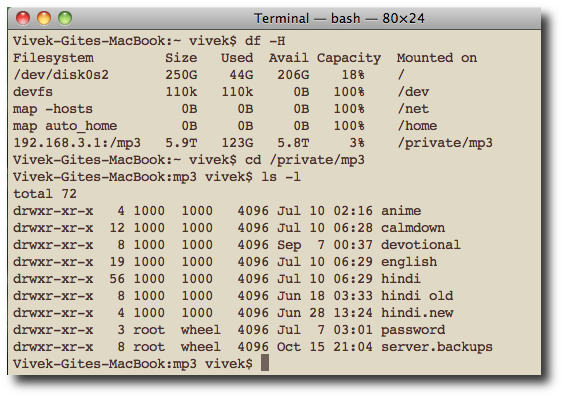 This is perfect for sharing files or centralized home directories. See how to setup an NFS server under RHEL / CentOS Linux and Ubuntu Linux here. How Do I Find Out Shared Directories? 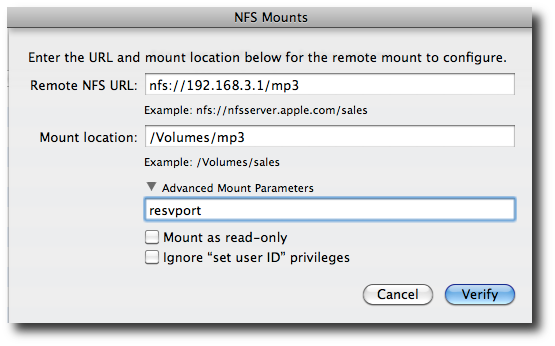 The showmount command show remote NFS mounts (resources). 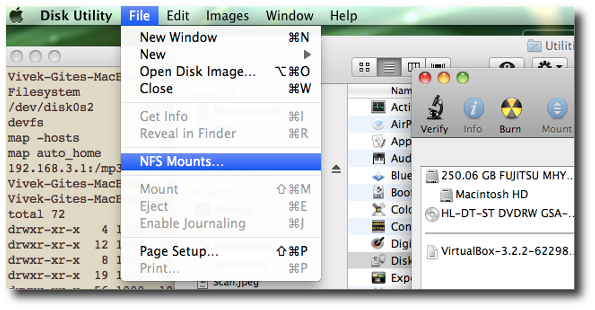 Note: The following entry “NFS mounts” in the Disk Utility does NOT exist in MAC OS X v10.8+. 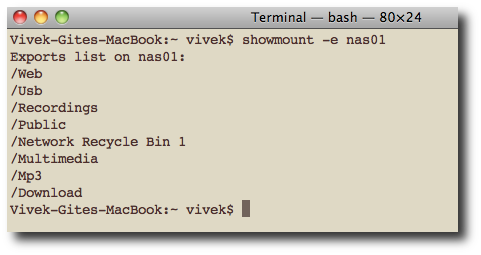 The following discussion only applies to the older Mac OS X version <= 10.7.x and eariler. Now, you can copy and paste files as usual. See mont_nfs(8) for more information. 192.168.3.1: NFS server IP address. nas01: NFS server dns name. mp3: Shared nfs directory name. /Volumes/mp3 is nothing but the mount location. This is a convenient place. In this example, you entered the URL as nfs://192.168.3.1/mp3, enter /Volumes/mp3 as the mount location. Please note that don’t create the subdirectory (mp3); it will be created dynamically when the share is mounted. Click the arrow in front of “Advanced Mount Parameters”. A new text entry box is displayed. Enter: resvport (this is only required if you get some sort of error [see above for more info or read mount_nfs man page]). 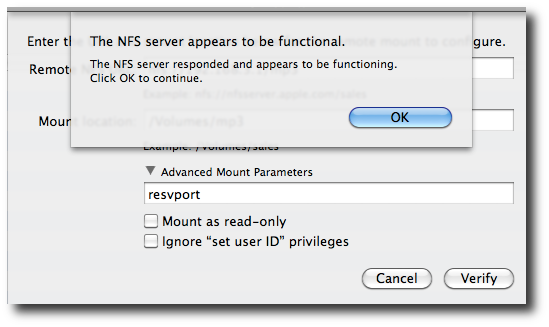 Fig.09: Verify NFS mount configuration which only checks that your NFS server is enabled and working correctly. You will see a popup window, stating that “The NFS server appears to be functional” > Click “OK” button to continue. Finally, Click “Save” button. You may be prompted for the password to make changes. 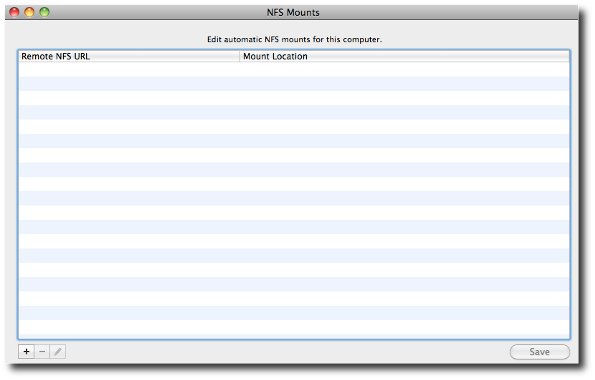 Your NFS share should appear at the mount location you entered above i.e. /Volumes/mp3.